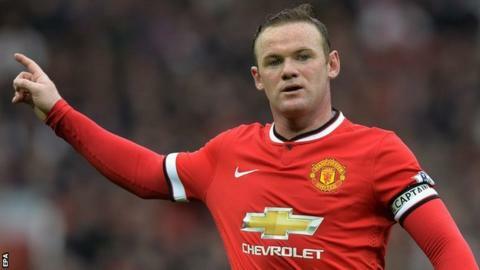 Manchester United boss Louis van Gaal says Wayne Rooney may play in midfield at Chelsea on Saturday as Michael Carrick and Daley Blind are injured. Rooney, 29, featured in midfield earlier this season but has scored six goals in his past nine games for the Red Devils since moving back up front. "Blind and Carrick could play in the holding midfield role," said Van Gaal. "I don't have another option or I have to play Wayne Rooney again in that position so I have to puzzle a lot." United's form has improved since the England international was moved into a more familiar position, their recent run including wins over Tottenham, Liverpool and Manchester City. Blind has not recovered from an ankle injury he suffered in the win over Manchester City last Sunday, while Carrick has not overcome the calf problem he sustained in the same game. Defenders Marcos Rojo, Phil Jones and Jonny Evans are also sidelined, though Van Gaal has replacements in Paddy McNair or Tyler Blackett to play alongside Chris Smalling. "It's the worst scenario," said Van Gaal. "But other players can take profit." Rooney's potential return to midfield for Saturday's match at Stamford Bridge (17:30 BST) could mean a recall for striker Robin van Persie, who has been out for nearly two months with an ankle injury. "This is the first week he's trained with the first team, but maybe we have to think about him," added Van Gaal. United are eight points behind Premier League leaders Chelsea, who have played a game less, and Van Gaal does not believe it is realistic that his side can challenge for the title. "It is possible, but it is not logical," Van Gaal, whose team have six league games remaining. "I believe in facts and the fact is we are behind Chelsea. "All right we have to play against them, so does Arsenal so we can lay pressure on Chelsea's shoulders [on Saturday], that's true and then you never know. "You have seen that also in previous Premier League seasons so it is always possible, but it is not logical."